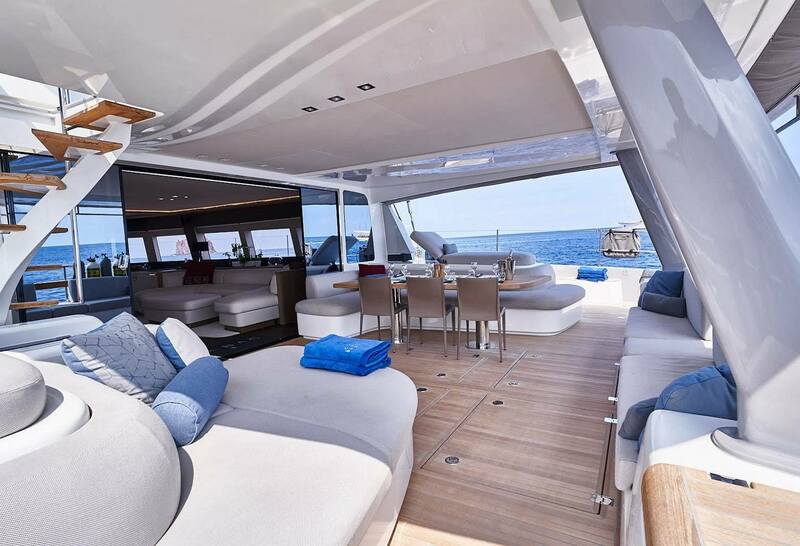 Measuring 23,28m (77’) in LOA and 11m (36’) in width, BABAC is an exceptional catamaran charter yacht offering great layout and large spaces. 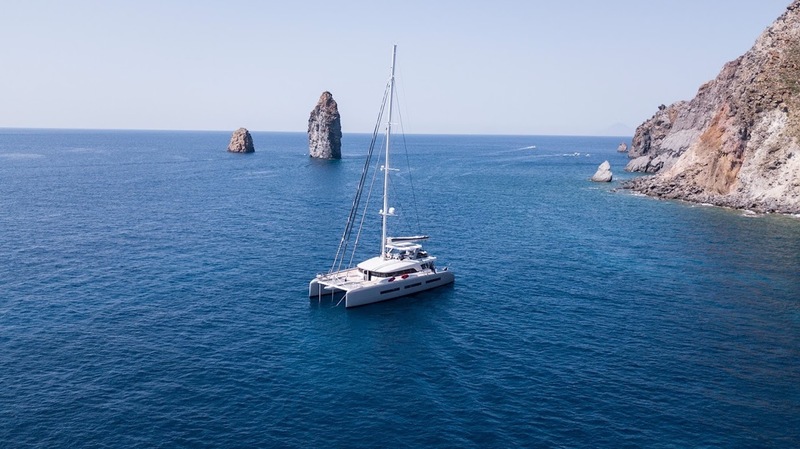 She was launched in 2018 belongs to the Lagoon Seventy7 series, the largest cat built by the shipyard at the time of her delivery. 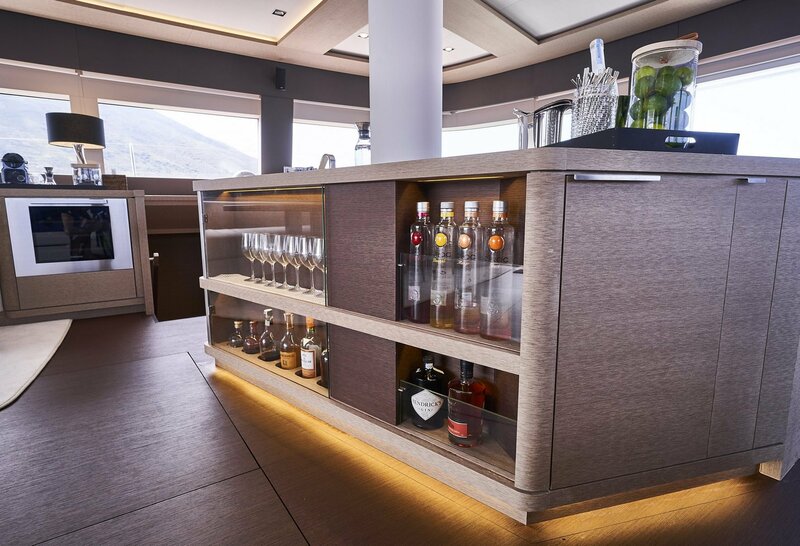 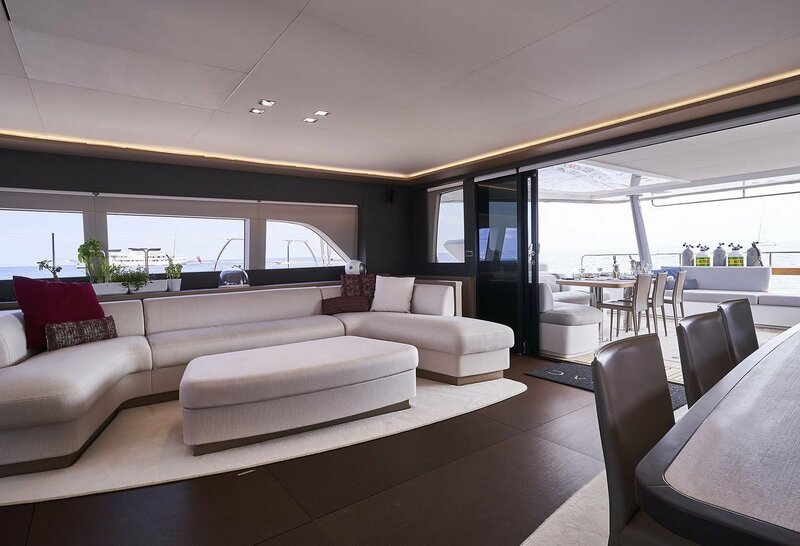 Interiors are modern and sophisticated, incorporating calming cream, beige and brown tones of colours, combined with timber panelling in grey oak, while the flooring has been created in darker oak. 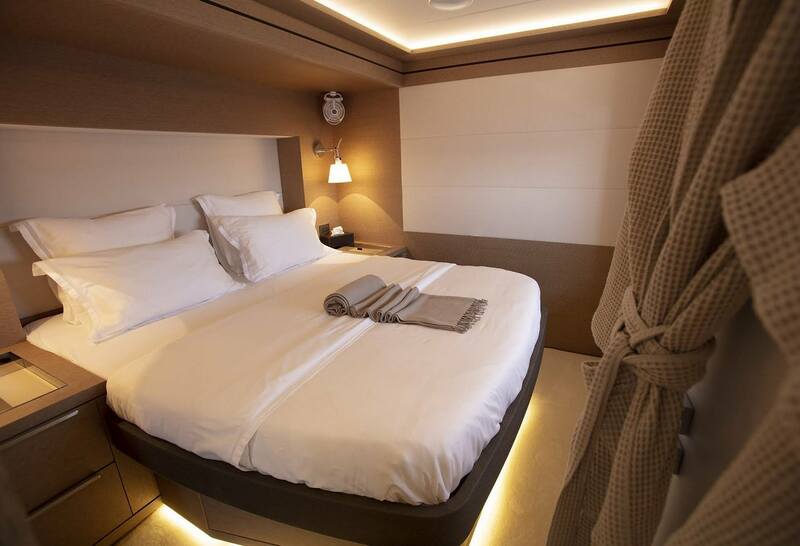 Deep red cushions, touches of blue and various decoration create a warm and welcoming ambience on board. 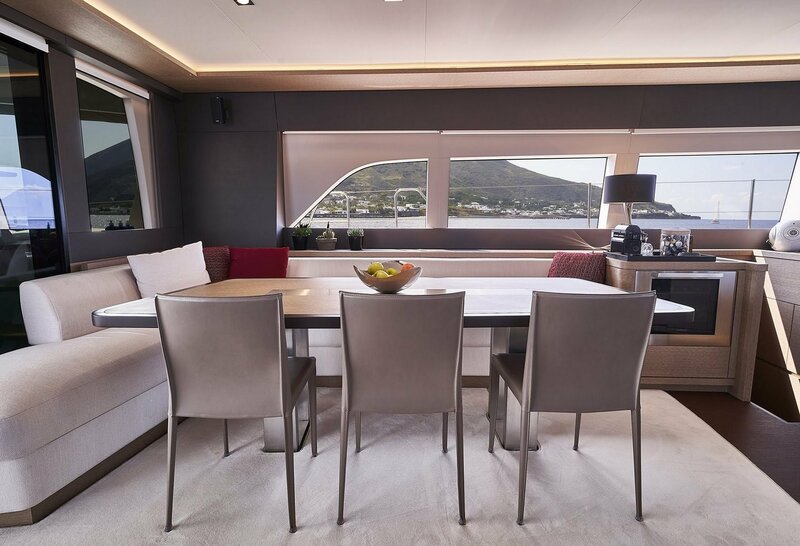 The vast saloon area consists of a lounging area as well as a dining area with unobstructed panoramic views. 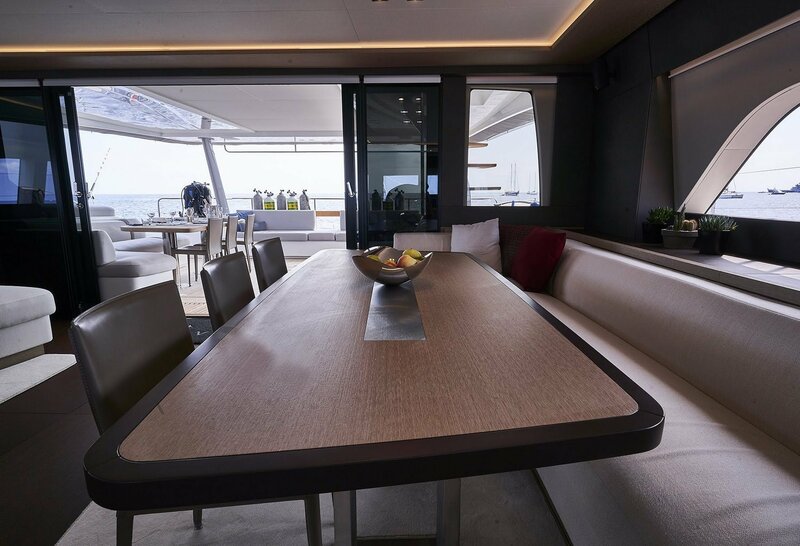 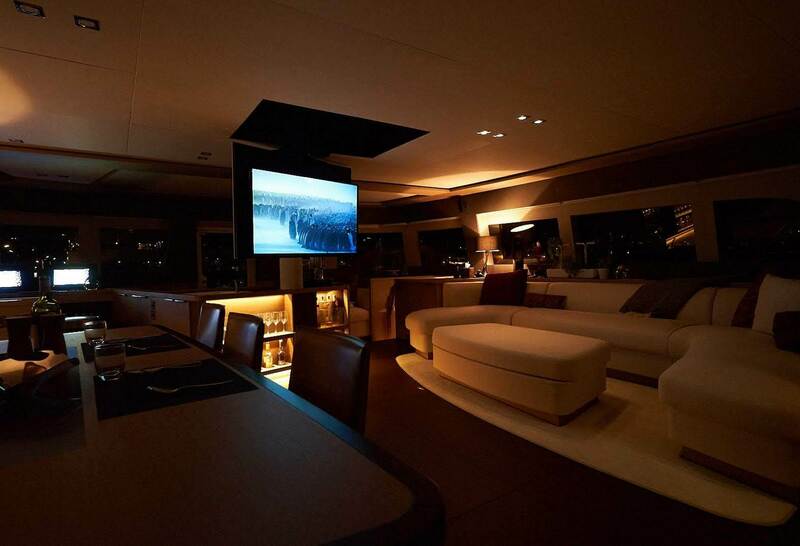 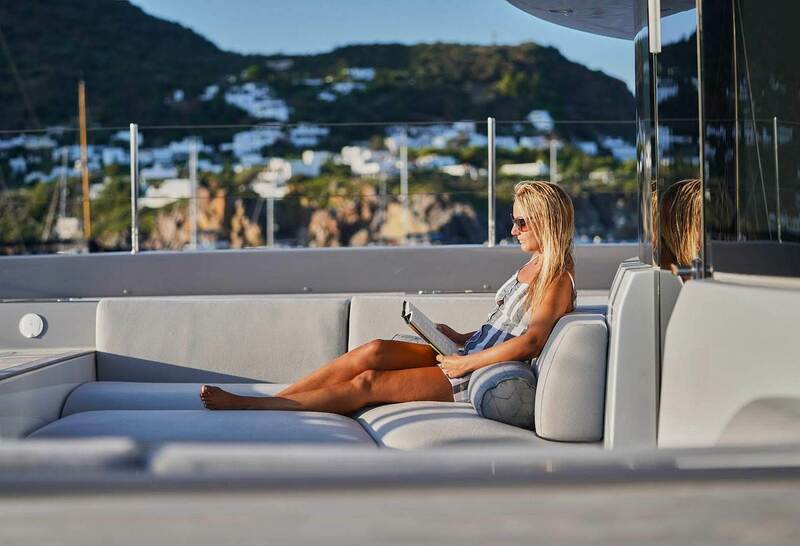 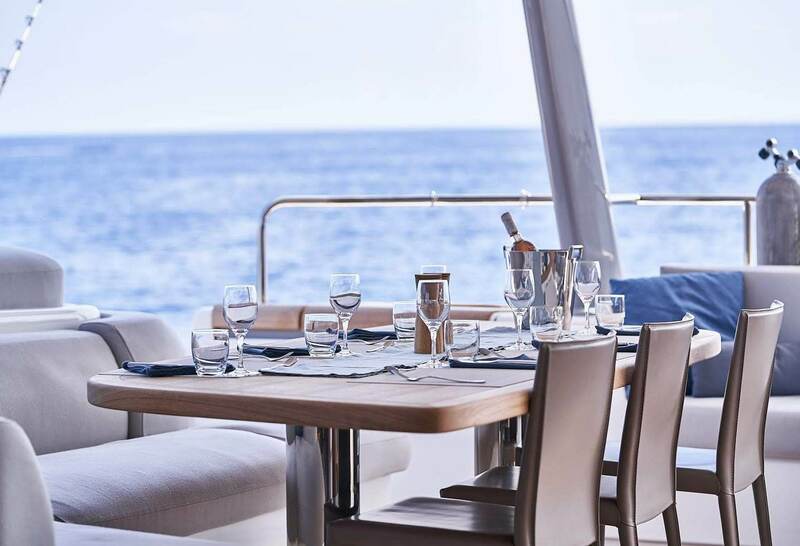 Above, the flybridge offers yet another lounge with seating and dining option as well as unprecedented vistas of the yacht’s surroundings. 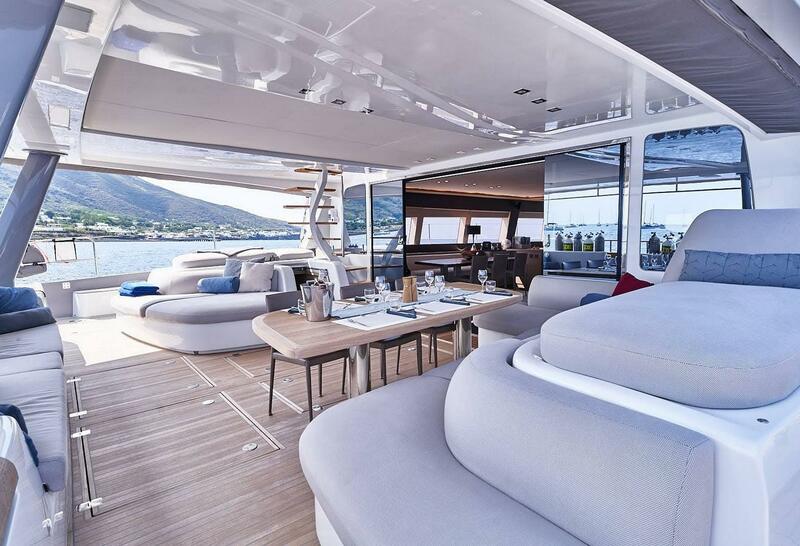 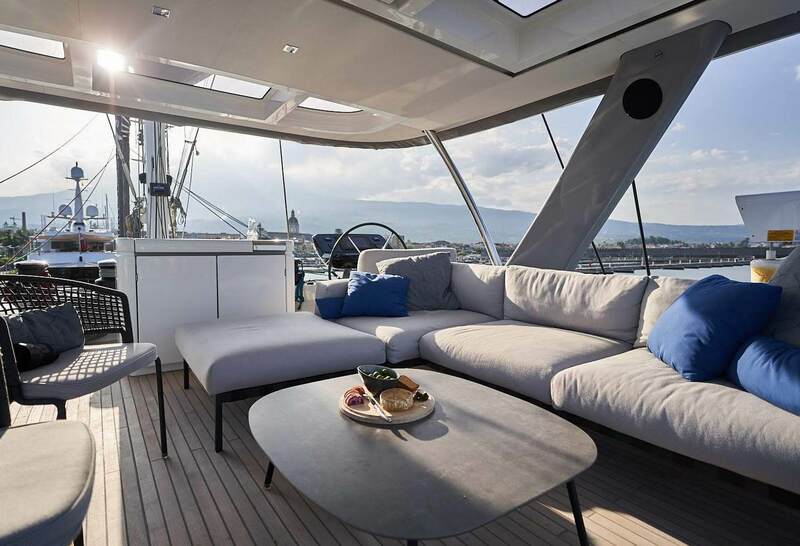 One of her most significant features is her huge foredeck with plenty of relaxation areas, seating and a large trampoline. 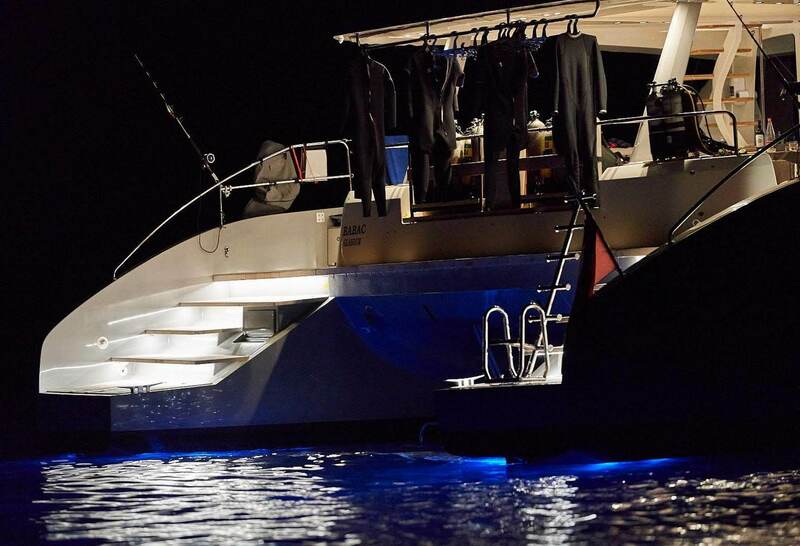 Aft features a large swim platform with easy access to the water and toys to enjoy during the entire duration of the charter. 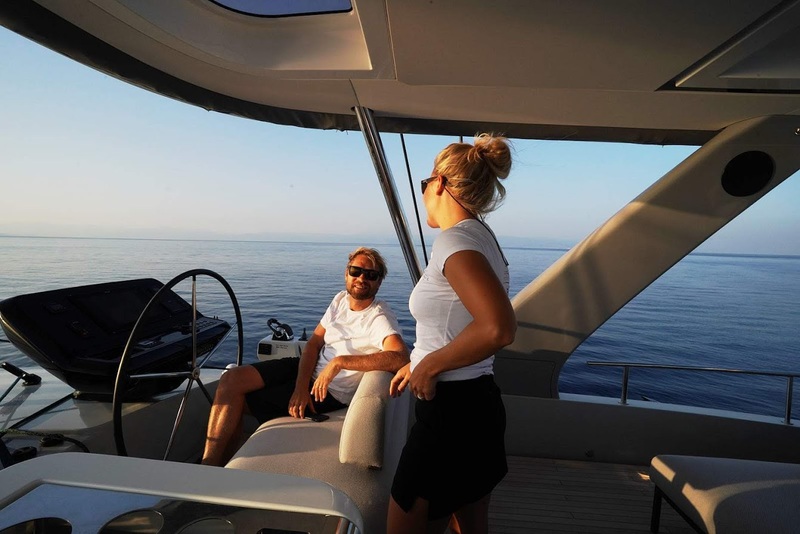 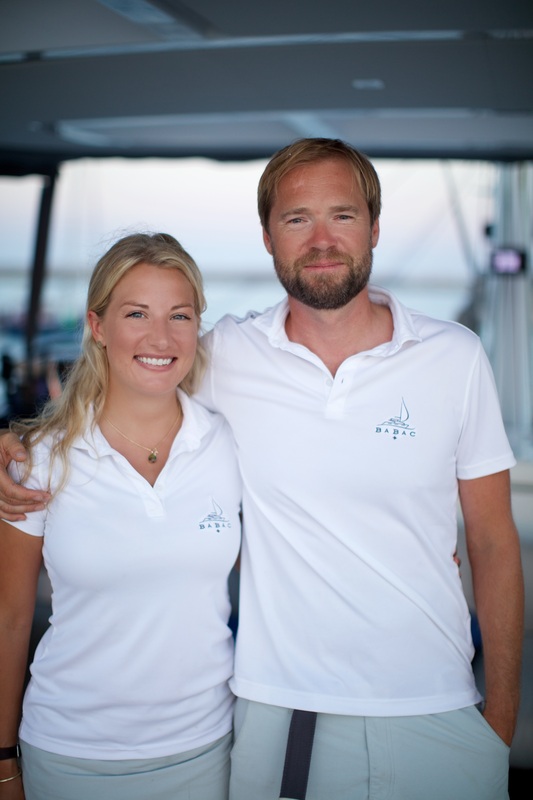 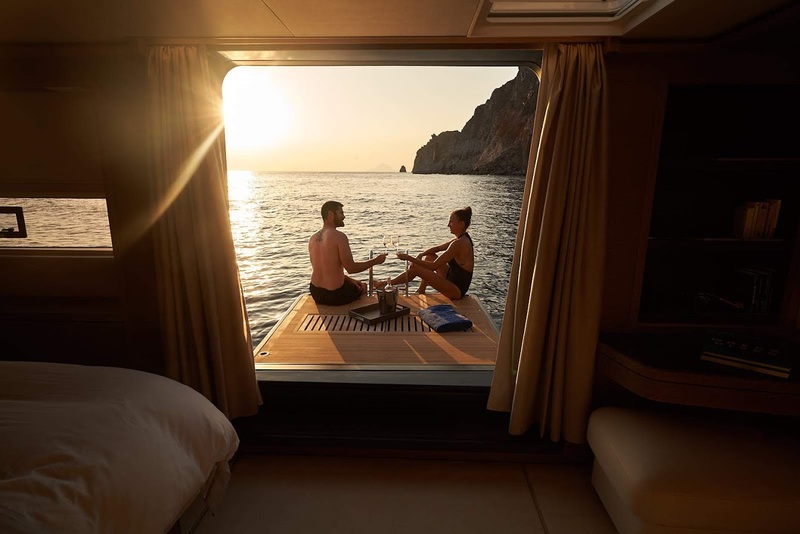 The yacht is also equipped with top rigging, carbon fibre boom, state-of-the-art electronic systems, carbon fibre helms, as well as marble and timber interiors. 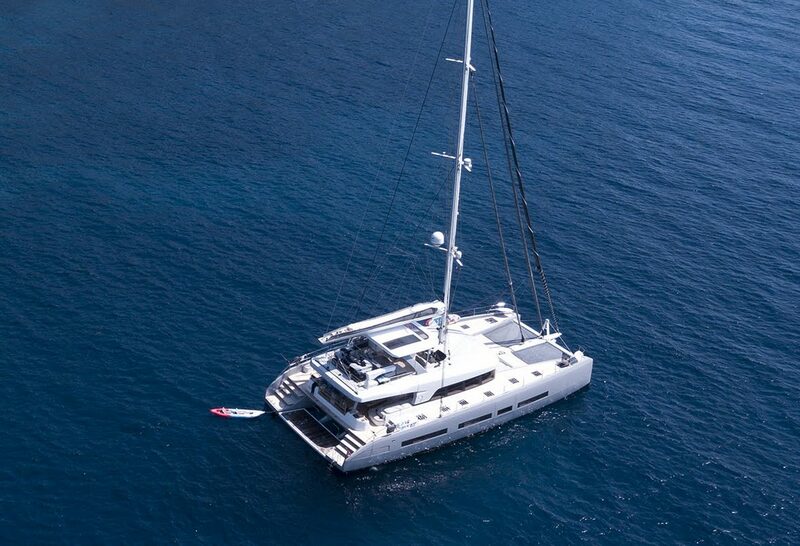 She is a very stable and elegant yacht with great volumes overall. 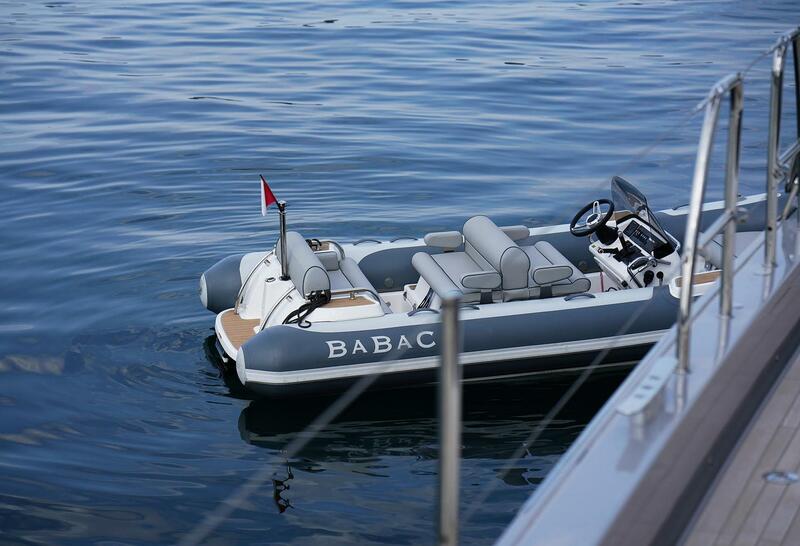 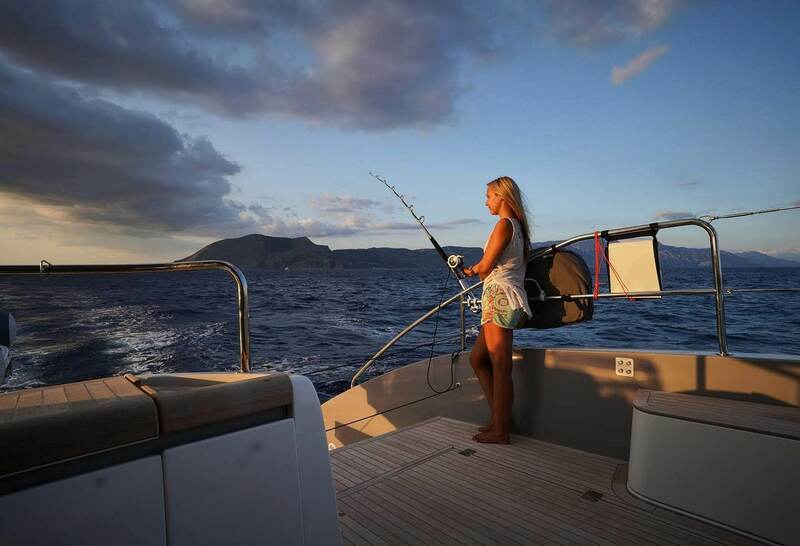 BABAC is powered by two VOLVO D4 180hp Diesel engines, cruising at speed of 8 knots. 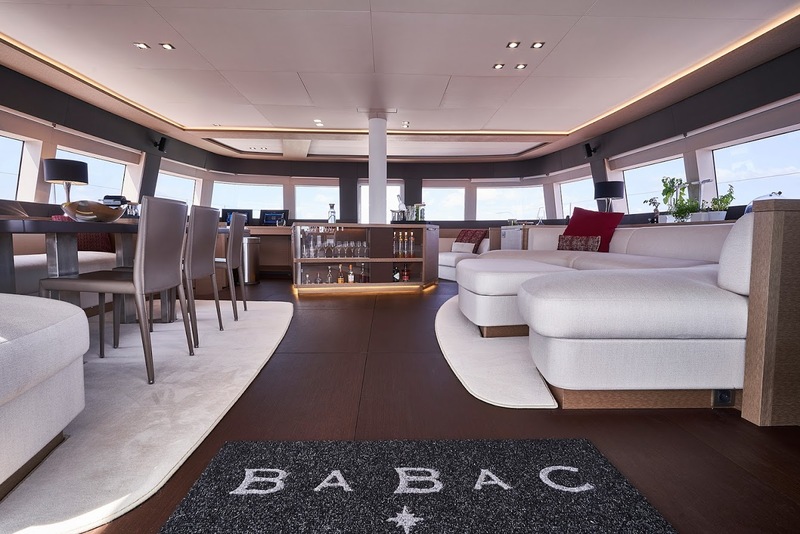 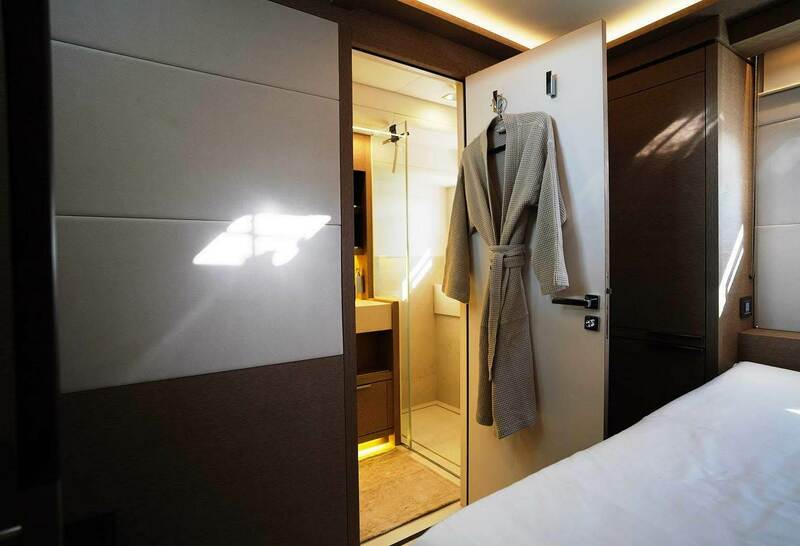 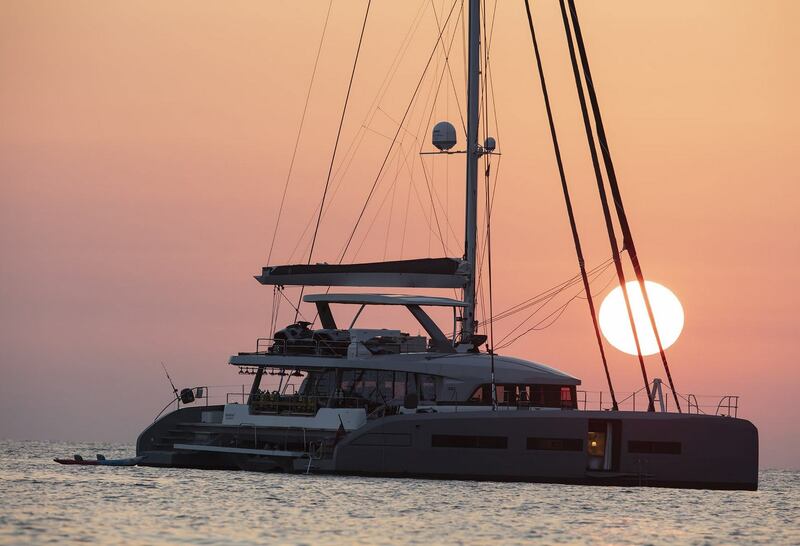 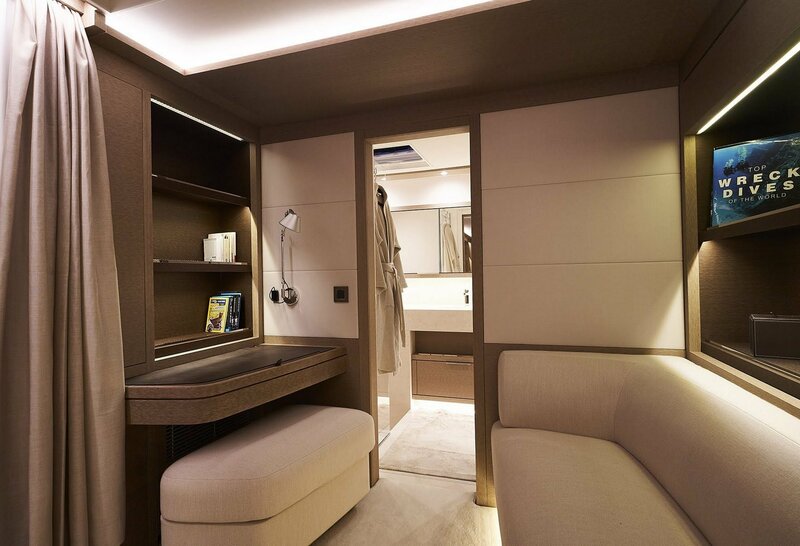 Up to eight charter guests will find comfortable, modern and spacious accommodation aboard BABAC spread over four cabins. 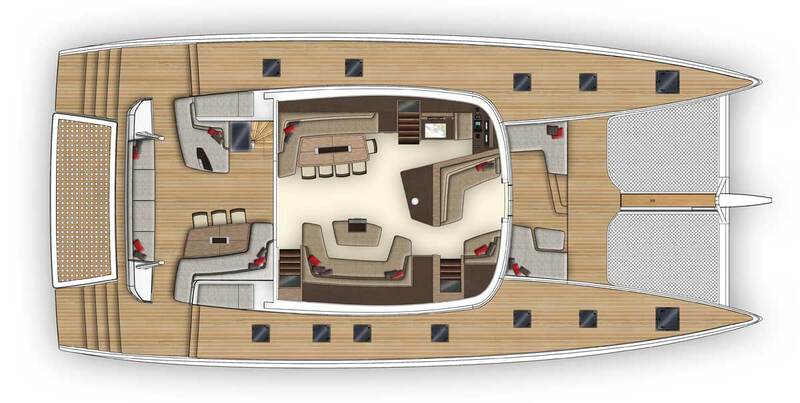 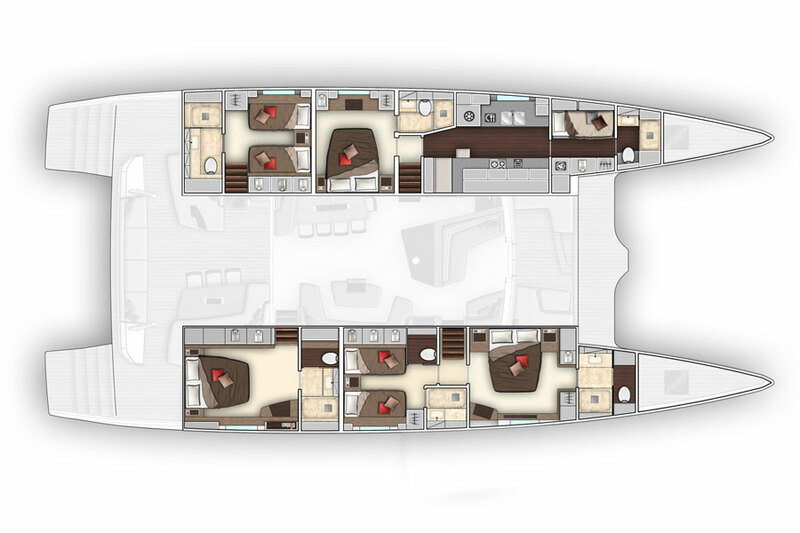 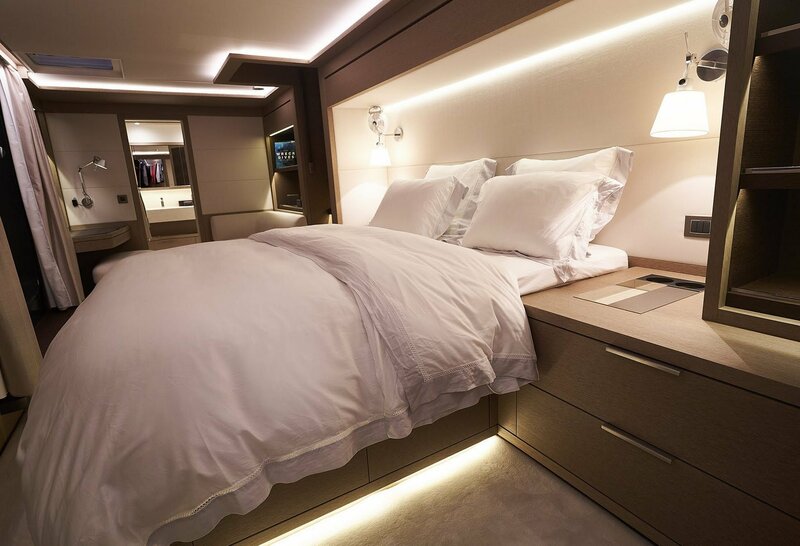 These include one King cabin and three Queen-bedded cabins, out of which one is convertible. 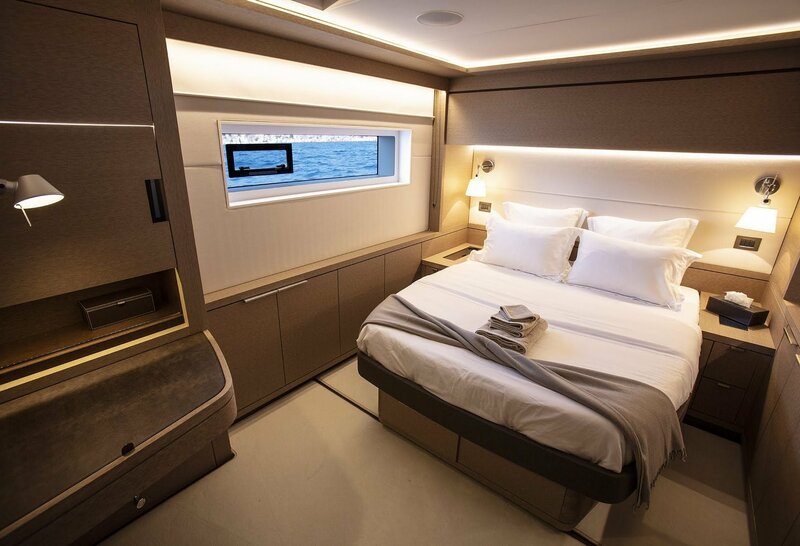 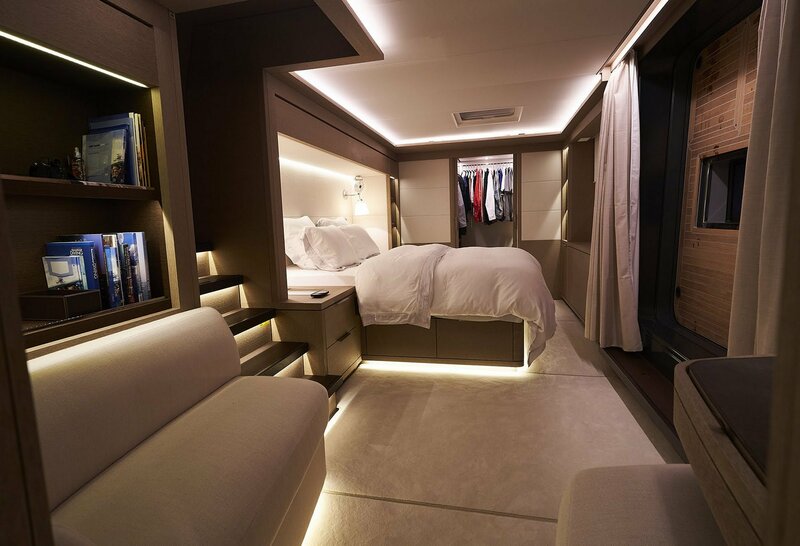 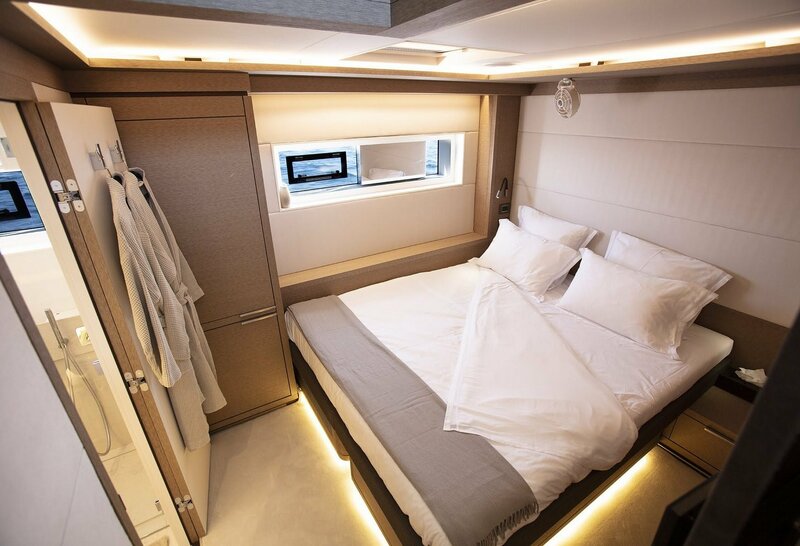 The master suite has its own private balcony, very unique for a sailing yacht, allowing for immediate connection with the water. 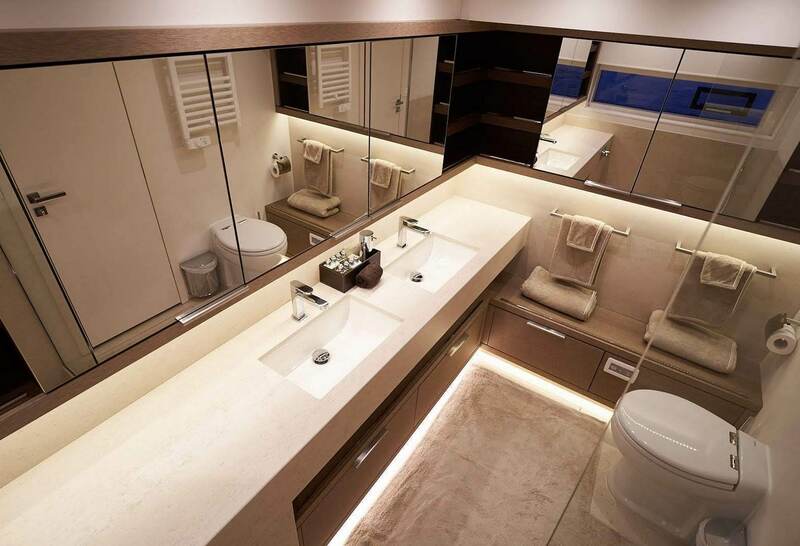 All cabins have their one ensuite bathroom facility.